Pre-audition Workshops for Spamalot have begun! 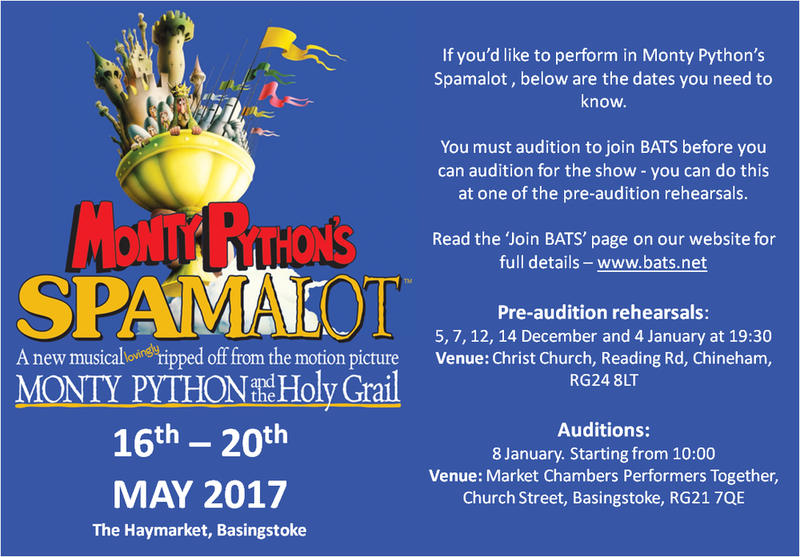 BATS' next show is the award-winning musical, Spamalot, taking place in May 2017... and with auditions taking place in January, our pre-audition workshops are now underway. Inspired by the classic film comedy Monty Python and the Holy Grail, Spamalot is a musical which hilariously sends up everything we love (or perhaps don't love?!) about the theatre, while telling the legendary tale of King Arthur and the Knights of the Round Table. There are some fantastic roles to be filled (male and female) and this is where you come in. Are you interested in auditioning? To find out more, do come along to one of our preview workshops to meet our members and to get the opportunity to learn the audition pieces, where our Director, Musical Director and Choreographers will be there to guide you through. We are also looking for strong male dancers, so please spread the word to help us to cast another great show!